Join Us!!! We are looking for someone to help us cover Asian Championships U16 basketball. Please send us an e-mail. If you love basketball, you would probably have seen some of the live matches at the FIBA Asia U16. The tournament was packed with some great talent and some nailbiting finishes and made for some great watch. And now that it is over, we can't just stop pondering over what we saw over the last few days. The FIBA U16 Asian Championship has just ended in Foshan, China and Australia have come out as a winner of the tournament. But one person that has come out as a key player from this championship is Kai Sotto of Philippines. In fact, such was Scotto's stint and performance in the championship, it hs left many wide awed. Even many sports betters didn't expect him to do well, a reason only a few made it big with the right game predictions on Betvictor. With his stint in the FIBA U16 Asian Championship Kai Sotto has established the fact that he definitely is the future of Philippine Basketball. Batang Gilas's race in the U16 championship might have been over, and they have failed to register any medal, but Kai Sotto has definitely emerged as a winner. The skill with which he plays the game is unmatched. The 15-year-old lad has shown immense talent with the way in which he used techniques of rebounding, blocking and efficiency. Each and every game that Kai has played was a treat to watch for any basketball lover. His efficiency score with six games that he has played has been 21.5 PER which is the best in this championship. Even Iran's best player Matin Aghajanpour couldn't beat him with a PER of 20.4. The Filipino was a debutant in the SEABA U16 championship in 2017 and who knew he would be the most talked player in the next season. This hyped centre from Batang Glias was just 6 foot 11 then but now has turned to a 7-foot tall guy who was the key player behind Philippine's semi-final entry. He also made some noteworthy contributions on the personal front while playing for Batang Gilas. With his extraordinary rebounding skills, he registered 13.5 rebounds which are a tournament-best and that too, per game. He is certainly someone oppositions will now fear more than ever. Moreover, with great defensive ability and blocking of 2.5, he has made a name in the tournament. With 16.8 per game, he is also 5th in the scoring, and that makes up for a huge achievement. Owing to a remarkable performance by Kai sotto Batang Glias made it to the semi-finals in the FIBA U16 Asian Championship, and irrespective of losing to China with a 54 to 60 defeat the Philippine basketball team has made a roaring entry in the FIBA U17 World Cup. He has much time in hand to brush up his skills before the U17 world championships and register a record as an Asian in the books of basketball and get his country to new heights. 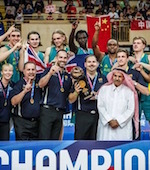 Australia celebrate Gold in Foshan. They knocked down hosting China in the title game tonight. Luke Travers (197-G-01) provided 22 points and 8 rebounds for the champions. Wani Swaka (198-F-01) tossed in 21 points in the win. China posted a 23:17 lead after ten minutes. But Australia responded with a 21:11 rally in the second term to surge ahead. Australia unloaded 53 points in the second half and rallied to the win. Sun Haoqin (191-F-03) replied with 16 points for China. New Zealand stepped onto the pedestal in Foshan. They edged Philippines to claim Bronze medals. Marvin Williams-Dunn (170-PG-01) posted 17 points to lead the winners. New Zealand used a 24:7 run in the second term to take a 21-point halftime lead. Philippines narrowed the gap in the second half but could not avoid the loss. Mitchell Dance (190-SG-01) had 16 points in the victory. Terrence Fortea (180-PG-01) had 18 points for Philippines. South Korea overcame Japan to finish fifth in the championship. Moon Jeonghyeon (190-F-01) produced 25 points and 14 rebounds in the victory. South Korea grabbed a 32:27 halftime lead. They followed with a 27:15 run in the third term to clear off for good. Cha Minseok (199-C-01) had 13 points and 11 rebounds for the winners. Keisei Tominaga (180-G-01) had 18 points for Japan. Iran wrapped up the campaign on a winning note. They topped Lebanon to earn the 7th position. Jalal Agha (205-C-01) provided 27 points to lead the winners. Iran unloaded 30 points in the second period to take a 10-point halftime lead. Iran unleashed 46 points in the second half and raced to the win. Matin Aghajanpour (199-PF-01) had 22 points and 13 rebounds in the victory. Rayan Zanbaka (189-SG-01) responded with 21 points for Lebanon.